For intermediate cleaning and postcleaning, please use a cloth that you can fold over and stretch tightly over the floor nozzle. You can also use the microfibre cloth (special accessory) for particularly thorough cleaning. We recommend vacuuming floors before steam cleaning. Only use on laminate flooring if you are sure that it has been laid and glued professionally. With half the steam volume, you can clean laminate flooring or varnished parquet flooring (not oiled or waxed!). The steam volume is adjusted on the steam gun. Work with two cloths (= 4 layers), so that as little steam as possible comes in direct contact with the area. Do not apply steam for too long in the same spot so that the floor does not get too wet. The small amount of residual moisture will dry quickly and streak-free. Even stubborn lime and soap residue can be easily removed with the abrasive cloth (microfibre bathroom cloth kit). Use the detail nozzle exclusively to avoid scratching chrome or stainless steel fittings. Hold it close to the object being cleaned and wait until the lime breaks up. If it still won't budge or is in an awkward spot, the nozzle can be fitted with a brush. Scrub the area whilst applying powerful blasts of steam. Cleaning fittings. If the grease has already been there a while, steady scrubbing and pressing is the only solution. Always apply steam whilst doing so. The grease will slowly accumulate on the cloth. The cloth should therefore be changed occasionally. For a streak-free result, finish by polishing the cleaned surface with the yellow microfibre cloth. Even stubborn, dried-on dirt can be removed by applying direct steam and scrubbing vigorously. Thicker layers of lime residue should first be doused in vinegar or lemon juice and left to absorb. Before first using a steam cleaner, carry out a deep clean. Wipe over the whole surface with a steam cloth and the manual nozzle. Tip for winter: warm up very cold panes beforehand from a distance of around 5 cm. Then, apply steam to the glass surface from top to bottom using the detail nozzle. Scrape the condensed water downwards in multiple passes using the squeegee. To avoid the formation of streaks, wipe off the squeegee periodically using a cloth. If a few drops remain on the pane after using the squeegee – not a problem. They can be wiped off easily and without streaks using the cloth. The detail nozzle is suited to targeted cleaning of tile crevices, and a round brush can be attached if necessary. After steam cleaning, the surface can be rubbed dry using a cloth. Note for silicone grouting: apply steam only briefly to avoid damaging the material. Stainless steel is all the rage – but it only looks good without greasy deposits. Particularly good results can be achieved with the soft velour cover and yellow microfibre cloth (special accessories) from the microfibre kitchen cloth kit. Glass-ceramic hobs are a problem zone for many cleaning methods – but not for steam cleaners. A stainless steel spiral scourer is attached to the round brush. These are available in any homeware store. There's no need to worry about scratches on the glass hob when steam is involved. The steam forms a kind of lubricating layer during cleaning. Crevices and edges of the hob can be cleaned with the detail nozzle and round brush (round brush attached to the nozzle) without using the cover. Even freshening up clothes is effortless with the additional clothing nozzle. The integrated lint remover removes hairs and lint from clothes effortlessly. Creases in curtains and clothes can be simply removed out without having to place the fabric onto an ironing board. Odours are also reliably removed. A weight off your shoulders! Simple, biologically clean and environmentally friendly: steam cleaning is the most natural way to clean - and therefore the ideal alternative to conventional cleaning methods. Our steam cleaners offer various application possibilities. In addition to cleaning, they also deliver outstanding results for ironing and textile care. Using steam will save you valuable time that could be spent elsewhere. Using the power of steam for household tasks, big and small, could not be simpler. How steam cleaning makes our lives easier. Long before the first people even considered cleanliness, steam emerged from the ground in volcanoes and geysers. But it wasn't until 1700 that the time had come to harness the power of steam for practical applications. Steam cleaning is a modern application of steam power. Why is cleaning with steam environmentally friendly? Quite simply: cleaning with steam does not use any chemicals. The combination of steam power and temperature alone is enough to break up stubborn dirt, making cleaning agents superfluous. This protects both water, the basis of life, and also the household budget. Steam cleaning takes the burden off nature and its resources, but also in other respects. For example, disposal of packaging for cleaning agents is no longer necessary, saving additional resources and energy. Moreover, water is especially economical when used as cleaning steam: a single litre of tap water is enough to create 1,700 litres of steam! This is enough for around 20 minutes of steam cleaning – long enough to completely clean a small apartment. And since electricity is only needed whilst the water is being heated, energy consumption is also kept to a minimum. Why is cleaning with steam healthier? Cleaning with steam protects you and your family. Unlike detergents, the condensed steam leaves behind no potentially allergy-inducing residues on the surfaces it cleans. This is particularly important for small children who like to put things in their mouths. Accidents caused by using the wrong cleaning agent, skin irritation or other negative health effects are no longer an issue thanks to steam. Allergy sufferers can also breathe a sigh of relief. Since the steam binds dust together and therefore does not eject allergens into the air (such as dust mites and their excretions), the quality of the atmosphere is improved significantly. Last but not least, the physical exertion from cleaning is also reduced with steam, since you let the steam do the work for you. Why does steam have such a strong cleaning effect? The secret of cleaning steam lies in the combination of the blast of steam and the temperature. It's not just easier to clean dirt, you can also access hard-to-reach areas much more easily and therefore clean more thoroughly. And completely without chemicals! In particular cases the cleaning power of the steam can be supplemented with mechanical cleaning, for example with a brush or cloth. On top of that, Since steam generation also removes minerals from the water, our devices do not leave behind any limescale residues or streaks. Why is everything so much faster and easier with steam? Steam means speed. Even stubborn dirt and grease is dissolved and removed in seconds by steam. Time-consuming scrubbing is not usually necessary. Steam saves you time even when ironing – the laundry does not require extra moisture and creases are removed considerably faster. And perhaps best of all, for different cleaning tasks, you only need one device that can do everything: a steam cleaner. This leaves you more time for the important things in life. How does a steam cleaner work? A steam cleaner works according to the same principle as a pressure cooker. Water is heated in a sealed boiler until it boils, creating steam. This takes between one and six minutes per litre of water, depending on the device. Tip: Steam forms best when the tank is not completely filled. Otherwise it is too wet and soaks in too quickly. When the water boils, the steam is applied in measured amounts via the steam gun. The higher the steam pressure, the faster the steam is forced out, and the better the dirt dissolving power. Quite simple really. Tip: Warm water speeds up the heating process. The pressure in the boiler reaches up to 4 bar, depending on the unit type. 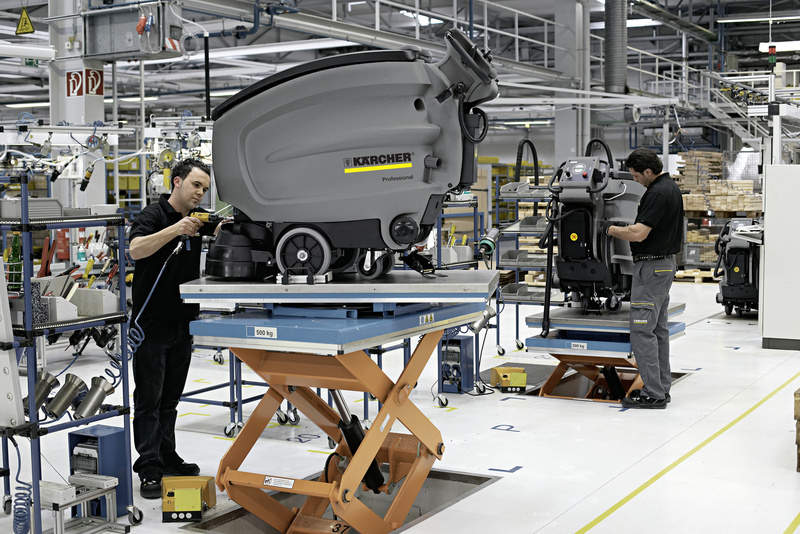 Kärcher steam cleaners meet all requirements with regard to safety. This is confirmed by certification from the TÜV and international testing centres. All electrically conductive parts are of course splash-proof. Steam is environmentally friendly – it uses no cleaning agents and has low water consumption. Steam delivers a hygienic clean – even in hard-to-reach places. Steam cleans effortlessly – forget scrubbing and polishing. Steam is healthier – no cleaning agents necessary. Steam is versatile – it can be used for cleaning kitchens, bathrooms or windows, as well as for ironing and on textiles. Steam saves time – cleaning is faster with steam. Steam saves money – since no cleaning agents are required.